Have little and gain everything. Well, except the tub. I cannot recall, at this moment, if I have ever professed my love for our bathtub. Like Mary Poppins, it is practically perfect in every way. Deep, long, and with that slope at the back for leisurely afternoons and pruned skin. Heaven! If you’ve been reading for a while then you probably know that I can be pretty quick to tears. There is just so much out in the world that inspires awe in me, so much that is worthy of that kind of emotion: sunsets with a sliver of moon, the sight of the hubster, beautiful cars and buildings, true love, kindness… The world is a truly wondrous place and worthy of deep reverence. I say this with the hope that you will, perhaps, see me as a genuinely sensitive person, not just some nut who cries a lot. Though, if you do, I suppose I’ve given you plenty of ammunition. Anyhoo, the reason for prefacing this post with all this weepy jazz is the extraordinary nature of the two films I saw this week. They are awe inspiring tear-jerkers. Friends, I cried, A LOT. First is Note by Note. 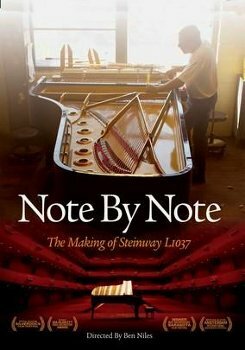 It follows the construction of a single Steinway & Sons Grand Piano, mark L1037, over the course of a year, from the milling of the wood to the final tuning of a single note. It is a meticulous and deeply human process, with the vast majority done lovingly and entirely by hand. In our world of get-it-now-and-super-quick, this film is testament to the value of art, patience, precision, and skill, where millimeters count, and time truly makes a difference. Equally important to this process is the individual, of which there are surprisingly many doing very specific jobs. They are caring and very passionate about their craft, most working for Steinway longer than they ever imagined (decades!). Much like the people in charge of their creation, these pianos are individuals with their own quirks and idiosyncrasies. It was both a surprise and delight to see these exquisite combinations of wood, metal, and wire anthropomorphised into various and sundry personalities: open, bright, shy, cruel, testy, boisterous, giving both their creators and players a bit of a surprise, despite their often identical outward appearances. So fascinating! 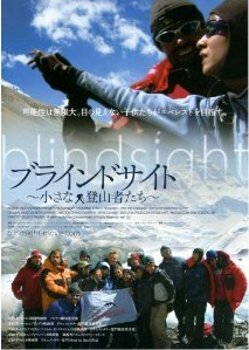 Last night, with Note by Note still on his mind, I suggested we watch a movie, and the hubster looked at me and said, “I don’t know how we’re going to top that last one!” Ever confident of my queue selections, I started my search, and when I saw Blindsight, a film that follows the journey of six blind Tibetan teens and their intrepid team of explorers, I got excited. He wasn’t convinced initially, but it didn’t take long before this group cracked both of our hearts wide open. Dang, where to start with this one! Sabriye Tenberken became blind at the age of twelve, but she’s never let it stop her from doing anything. She decided to set up a school for the blind in Tibet, arrived entirely on her own, and got to work. The school is the only one of its kind in a part of the world where the blind are treated as pariahs, working through some pretty serious karma from a past life. They are seen as burdens, not allowed to attend school (save this one), and often hidden from the rest of society, except to beg for money, their parents embarrassed and ashamed. Sabriye was inspired by Erik Weihenmeyer, an inspiration in his own right. He’s the first blind man to ascend Mt. Everest (and is part of an elite group of mountaineers to reach the the Seven Summits – the highest peak on every continent). She contacted him, and they devised a plan to take her six strongest students, along with a team of experts, on a trek to neighboring Lhakpa-Ri, which stands at a staggering 23,000 feet. The journey is far from easy, and they encounter their fair share of obstacles, but they triumph, each in their own way. The most important message, I think, is that they are not less than. They can climb mountains! More importantly, they can create a community of their own choosing and be nourished and uplifted by it. Great for all of us to remember, really.